Stony Brook Football routed its first-round opponent, Lehigh, 59-29 at Kenneth P. LaValle Stadium on Saturday in the Seawolves’ first playoff appearance since 2012 and their first Football Championship Subdivision playoff victory since 2011. The Stony Brook offense amassed 622 total yards, the team’s most since Sept. 8, 2012, in large part thanks to 354 rushing yards and six touchdowns from four different running backs. 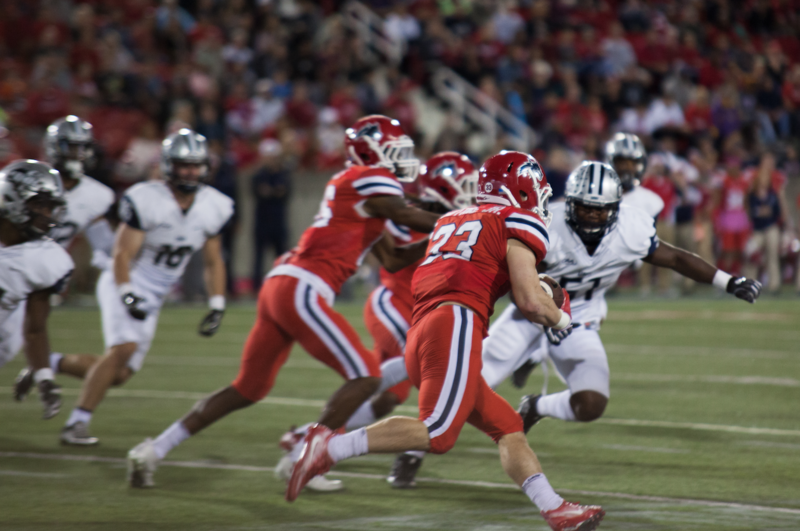 Liotine finished with 133 yards and two touchdowns on 17 carries to lead Stony Brook’s running game. Junior running back Jordan Gowins ran for 59 yards and two touchdowns. Gowins’ cousin, senior running back Stacey Bedell, ran for 82 yards and a touchdown. Even senior running back Sherman Alston Jr., the fourth man on the depth chart, ran for 87 yards and scored his first rushing touchdown as a Seawolf. Head coach Chuck Priore favors a backfield rotation and on Saturday, he got to show off all his weapons despite injury concerns. The Lehigh defense held Stony Brook scoreless in the first quarter and kept the game within 10 points at halftime. Then, less than three minutes into the third quarter, the Seawolves took control and never looked back. It took 46 seconds of the third quarter and two plays – a 31-yard run by Bedell and a wide-open 40-yard touchdown pass to junior tight end Cal Daniels – for Stony Brook to go up 31-14. A short three-and-out later and the Seawolves once again had possession. Junior quarterback Joe Carbone handed the ball off to Liotine three times in a row to quickly march 47 yards downfield for another touchdown to give Stony Brook a 38-14 lead. Overshadowed by the overpowering run game, Carbone threw for 268 passing yards and two touchdowns on 13-29. Carbone completed passes to six different receivers, none of whom were senior wide receiver Ray Bolden, who was sidelined with a broken foot. Instead, Carbone relied on graduate wide receiver Harrison Jackson, who had three catches for 122 yards, including a 76-yard touchdown dash. Jackson has been at the center of the team’s late game heroics in the last three weeks of the regular season, catching game-winning touchdowns against conference rivals Albany and Maine. His Hail Mary reception as time expired against Maine was the number one play on SportsCenter’s Top 10 on Nov. 18. Jackson was in another highlight reel play on Saturday, laying down a brutal block on a Lehigh defender while sophomore wide receiver Nick Anderson hurdled another defender in a jaw-dropping display of athleticism. Lehigh entered the day with the fifth-best offense in the FCS, in large part due to junior running back Dominick Bragalone, who led the FCS in touchdowns with 21 and was second in rushing yards with 1,335. The Stony Brook defense limited Bragalone to 75 yards on the ground and one touchdown, a nine-yard pass as time expired in the third quarter. Sophomore cornerback Gavin Heslop led all Seawolves defenders with a career-high 12 tackles. Fellow secondary players, senior Chris Cooper and senior Travon Reid-Segure, had 10 and 11, respectively. Junior linebacker Shayne Lawless had eight tackles and a sack. Senior safety Tyrice Beverette rounded out Stony Brook’s top statistical contributors on defense with seven tackles and a sack in just the second half. However, Beverette had to sit out the first half after getting ejected in the Nov. 18 game for targeting. The victory sends the Seawolves to the second round of the FCS Playoffs for the first time since 2011. Stony Brook will travel to Harrisonburg, Virginia to play reigning national champion James Madison on Dec. 2. The top-seeded Dukes received a first round bye after holding the top spot in the weekly rankings all season and winning the Colonial Athletic Association. Priore echoed a similar sentiment, unfazed at the prospect of facing an FCS powerhouse riding a 23-game win streak.